The Smith & Kearns was created by the Blue Blazer's Gerbert "Shorty" Doebber in 1952. Shorty named it for two oilmen who were regulars at the bar: Smith and Curran. Over the years, the drink was distorted from its original name and ingredients. According to the stories, the loud atmosphere in bars caused the name 'Curran' to be misheard as 'Kearns' and, over time, the original creme de cacao was also replaced with coffee liqueur. 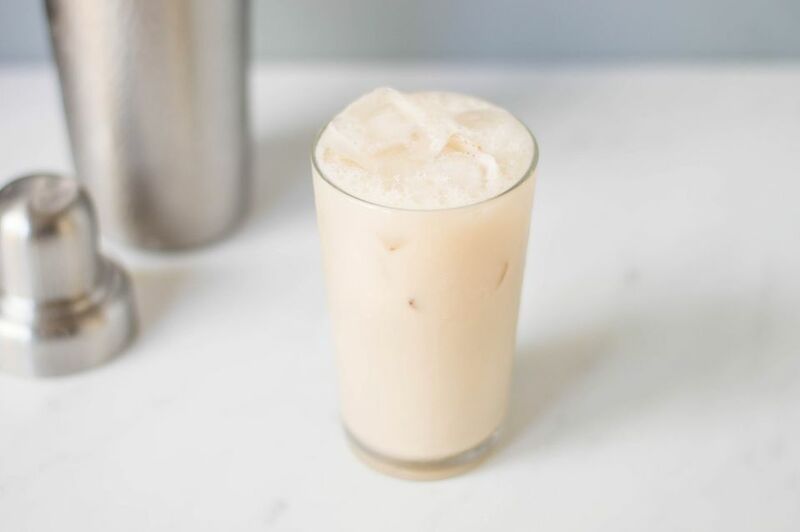 A lot of that may be due to the White Russian's growing popularity in the 1960s, which helped make Kahlua a star of the bar. Whether you take it with coffee or chocolate, the Smith & Kearns is a tasty beverage. It's light on the alcohol, so it makes a nice happy hour drink and the soda and cream combo gives it that ice cream float sort of feel. It's actually one of the more refreshing cream cocktails. If you add vodka to this drink you will have a Smith & Wesson and that recipe is below. Pour the coffee liqueur and cream into a cocktail shaker filled with ice. This drink is often also served without shaking or stirring but in layers. Pour the liqueur into a glass with ice, add cream and top with club soda. Smith and Wesson: Just add vodka. As with other creamy vodka drinks, there's no need to use the best vodka you have in stock for this one. Your favorite 'well' vodka will do just fine and there is a variety of great budget-friendly vodkas available today. To make this drink, mix 1 ounce each vodka and coffee liqueur with 2 ounces club soda in a highball glass filled with ice. Fill with club soda. If you want to add a little twist, try pouring a coffee or chocolate vodka. In fact, that's a great way to get both of those flavors into the drink. I'd choose a coffee vodka with a chocolate liqueur or vice versa. You really can't go wrong either way. How Strong Are These Cocktails? These two cocktails can be as light or as strong as you want to make them, though it is difficult to make them very strong and they are not meant to be that way. These are casual drinks and balance between liquor and mixers is key to making them taste the best.